The Rabbi with a Blog (Rabbi Jason Miller): Do We Go Overboard Cleaning for Passover? Do We Go Overboard Cleaning for Passover? Orthodox $89.95, Conservative $49.95; Reform $19.95. 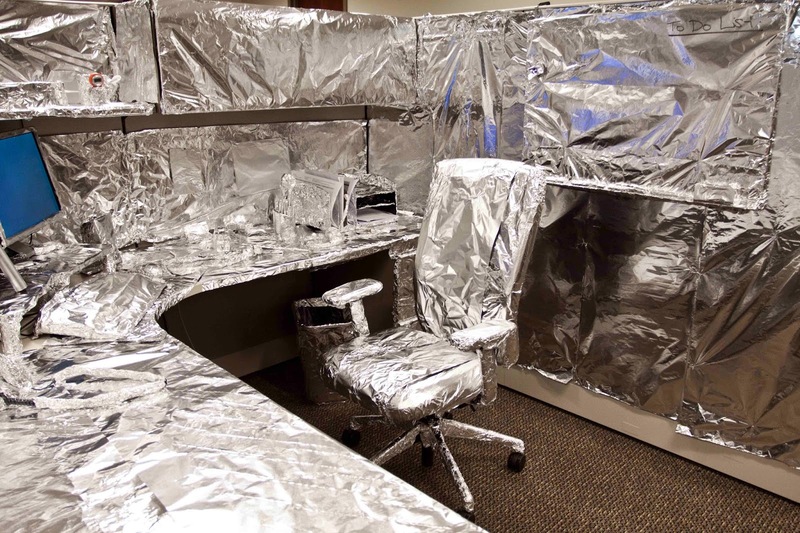 The second image is of a person's office cubicle and it's completely covered in aluminum foil. Even the desk chair, computer, keyboard and mouse are completely covered in aluminum foil. Most likely this photo was taken of the scene of an office prank, but I like to circulate this photo with the question, "Do we go overboard when it comes to Pesach cleaning?" Let's look at the first photo. Is there some truth to this? I always maintain there has to be some truth to a joke for it to be funny, so let's say that on the whole, yes, Orthodox Jews would spend more money for Passover cleaning than Conservative Jews and Conservative Jews would spend more money for Passover cleaning than Reform Jews. Perhaps, this image strikes us as offensive, but we'll unpack that in a moment. I remember as a kid before we got granite counter tops watching my mother cover all the counter tops in aluminum foil and then redoing this process each morning of the holiday because some of the aluminum foil had ripped the night before causing little sections of the white Formica counter to be revealed. This was done despite the fact that our house was completely spotless after having been thoroughly cleaned for the holiday. The thinking was that the counter is of a porous material and would have retained some of the chametz from the year which would contaminate our Passover food. We all spend exorbitant amounts of money on this 8-day holiday (only 7 days in Israel) to get special food that has been labeled kosher for Passover. We take Spring cleaning to the next level and then up a few more levels to make sure there is no chametz in our homes. We stockpile enough Kosher for Passover food to feed an army as if we're planning to never return to a grocery store ever again or that the supply of matzah may run out. Are our intentions misguided? Most rabbis encourage congregants to fully embrace the strictures of Passover, and I certainly want everyone to observe the holiday with fervor and joy, but I question what can only be characterized as the intense OCD-like tenacity with which we tackle the minutiae of Passover observance. After all, our ancestors in Europe weren't buying kosher for Passover bottled water! There are certainly some core laws of Passover that we're all familiar with. These include avoiding the consumption or possession of chametz, eating matzah, drinking four cups of wine or grape juice at the Seder, and telling the story of the exodus while imagining that we, ourselves, had left Egyptian slavery on the journey toward freedom. The most important mitzvah or commandment of Passover, however, is one that we no longer follow. The Tradition commands us to eat the Passover sacrifice, known in Hebrew as the Korban Pesah. We are instructed to eat this Pascal sacrifice or offering in a state of ritual purity and that's what I think we should focus our attention on as we prepare for Passover. We should spend more time trying to achieve this state of ritual purity that our ancestors strived for when eating the Pascal sacrifice, and less time stressing out with the minutiae of chametz. I hear a lot of stories of people spending days cleaning under couches and in crevices on the kitchen floor. However, it's important to remember that dirt is not chametz. If crumbs have been hiding in the cracks under your cabinets, that's called garbage not food. To eat of the Pascal sacrifice we have to be spiritually pure. Our souls have to be cleaned out. The idea is that we should transcend our everyday experience of life and place ourselves on a higher spiritual plane. You see, in Judaism we have an elaborate system of purity and impurity. Think of these as order and chaos. Our world is made up of order and chaos -- both are essential. We must seek out order as a way to put limits on the chaos and make the world a better place for us and for our descendants. Each year as we're preparing for Passover, our Christian friends are preoccupied with Lent. This time of Lent is also a spiritual cleansing time when they give something up that they love. A good friend of mine gives up drinking alcohol during Lent each year. His wife gives up all sweets -- no candy, no sugary soda, no sweet desserts. Some people give up using profanity, or smoking, or video games. Lent is a time for people to clean up their act so to speak. While I'm not proposing Jews begin observing Lent, I do think that the idea of this spiritual cleansing is in line with the notion of becoming purified in order to eat of the Pascal offering -- and that is precisely the focus of Passover. Maybe we use the Passover preparation time to consider what we need to do in order to improve our lives. Maybe we should spend more quality time with our spouse and children, dedicate more volunteer time to local nonprofit organizations, set aside more money for tzedakah each year. Passover occurs about 6 months after the High Holidays so it's really an opportune time for us to do a spiritual checkup anyway. We can do a midway audit on our Jewish New Year's resolutions. Pesach has become a holiday of cleaning and scrubbing and dusting and vacuuming. And that's all fine and good -- who doesn't appreciate some heavy Spring cleaning this time of year. But the real experience that God expects of us is for us to do some spiritual Spring cleaning. To rid ourselves of the negativity -- the spiritual chametz -- haughtiness, arrogance, the ego. We should be striving for renewal in our hearts, and not simply in our homes or specifically in our kitchens. As we shop, clean, pack, unpack, set the tables, and prepare the elaborate Seder meals over the next week, we should be mindful to place the emphasis of the holiday on the correct place. Chametz isn't dirt or dust or garbage. It's that which we must rid ourselves of in order to be of pure souls for this significant festival. We may no longer eat of the Pascal offering and we only discuss it at the Seder, but let us remember that our ancestors took this task very seriously. Give up something this year for the Jewish Lent. Rid yourself of that which you're not proud of and would be better off without. Discard the metaphysical chametz while you're getting rid of the literal chametz. Kedoshim Tihiyu -- And then, we shall be holy and closer to our God.